I have never been a teacher to give my students comprehension and knowledge-based questions. I like to know that students can use the information they are learning and use it different ways. 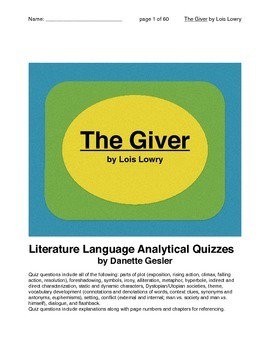 My quiz questions include all of the following: parts of plot (exposition, rising action, climax, falling action, resolution), foreshadowing, symbols, irony, alliteration, metaphor, hyperbole, indirect and direct characterization, static and dynamic characters, Dystopian/Utopian societies, theme, vocabulary development (connotations and denotations of words, context clues, synonyms and antonyms, euphemisms), setting, conflict (external and internal; man vs. society and man vs. himself), dialogue, and flashback. Included also are explanations of nearly all the answers along with page numbers and chapters for referencing. 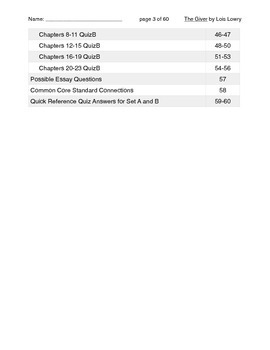 This document includes six quizzes with ten questions each, except the final quiz has eleven questions. 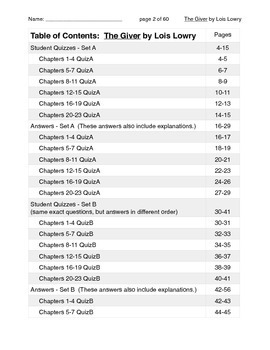 In case you have students absent the day of the quiz and you want to give them the same questions but with different lettered-answers, I have a second copy of the quizzes with the same answers but in a different order.